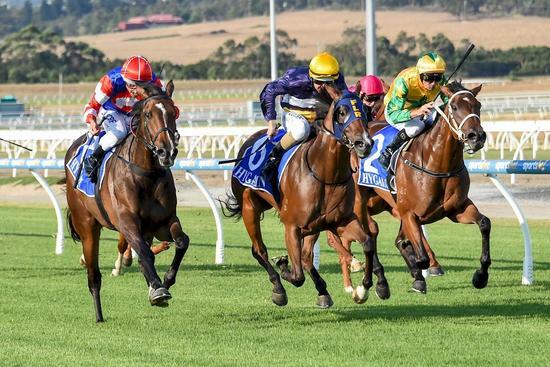 The VRC Oaks-team was back in action for Precocious Girl’s fighting win at Pakenham. Trainers Mathew Ellerton and Simon Zahra, syndicator First Light Racing and jockey Damian Lane teamed up to win the VRC Oaks with Aristia in November and Precocious Girl gave the team another success. Precocious Girl ran third at Cranbourne at her previous outing but a drop in distance and the addition of blinkers were ingredients for the daughter of Choisir’s breakthrough win. Lane had to negotiate the outside barrier in the Swear @ Spendthrift 3YO Fillies Maiden Plate (1200m) but let Precious Girl find her rhythm in the early and middle stages. Lane took Precocious Girl to the front at the 200m before she held on despite a late challenge to score narrowly. Lane said he was confident of victory halfway down the straight but Precocious Girl tired late. “She got beaten for a little bit of speed early so I was happy to let her find her rhythm,” Lane said. “I thought at the 200m, that she had the race won, but at the 50(m), I wasn’t so sure because she got a bit tired late. Precocious Girl’s maiden win came at her fifth start while she earned a $19,250 winner’s cheque for connections. Congratulations to Precocious Girl’s big band of owners and out great supporters at First Light Racing.